On July 15, Rick Allen and Sandy Allan succeeded in making the first ascent of the Mazeno Ridge on Nanga Parbat (8126m). This 13km-long route was first attempted in the 1970s and was widely considered to be one of the Himalayas last great challenges. 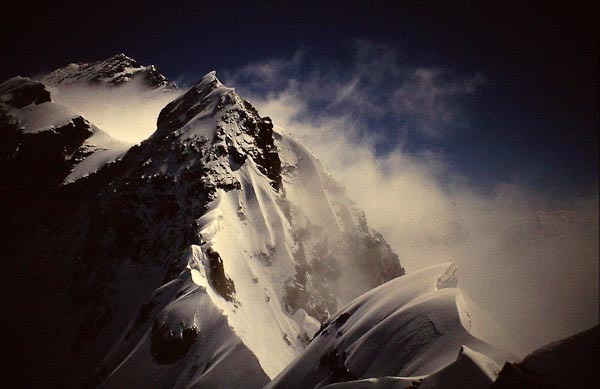 It is the longest ridge on any 8000m peak and Rick and Sandy’s ascent and descent took an arduous 18 days. This blog deliberately focuses on Scottish winter climbing, so I do not intend to describe their ascent here, and neither is it my story to tell. However, their success does have direct relevance to www.scottishwinter.com, as both Rick and Sandy are Scottish climbers with a strong background in Scottish winter climbing stretching back over 30 years. Sandy has taken part in many first ascents, often partnering Andy Nisbet. It is difficult to single out a single climb, but the route that springs to mind is the first ascent of The Rattrap (VIII,8) on Central Gully Wall on Creag an Dubh Loch in 1986. This was only the second time this stupendous face had ever been climbed in winter, and despite at least a couple of determined attempts, the route is unrepeated. Rick has a similarly impressive Scottish winter pedigree, with the first winter ascent of the spectacular Raven’s Edge (VII,7) which he climbed with Brian Sprunt in 1984, to his name. The last time I climbed with Rick was in February 2009 when he was on a flying visit to Aberdeen. It was a typical Rick Allen determined and opportunistic outing. Rick had dug out some ancient climbing clothes from the 1980s from his attic, we skied up Glen Callater in deep powder snow (Rick on ancient wooden skis) and against all the odds, climbed a good new icy mixed line on Creag an Fhleisdeir. It is Rick and Sandy’s combined Himalayan experience however, that undoubtedly contributed to the Mazeno success. I cannot do full justice to all their climbs, but their routes include the Muztagh Tower (Sandy), a 12-day first ascent on Ganesh II (Rick) and new route on Dhaulagiri (Rick). Together, they have climbed a new route on Pumori, previously summitted Nanga Parbat, and both climbed Everest (on separate trips). Rick and Sandy’s ascent of the Mazeno Ridge has been described as the most important British success in the high Himalaya since Steve Venables ascent of the Kangshung Face in 1988. From a Scottish perspective, it is almost certainly the most impressive mountaineering achievement since Dougal Haston climbed Everest in 1975. I was thrilled when I heard of their success last Thursday. My emotions ranged from relief that they were safe and well through to great excitement at their fantastic success. But above all, it is hugely inspiring that two friends I’ve known for over 30 years, have pulled off the mountaineering ascent of their generation. Postscript July 25: I wrote the above account when information on the Mazeno Ridge ascent was still limited and scant. Full details are now emerging on the expedition website which is retrospectively updating the diary of events. It is clear that Rick and Sandy’s success was greatly supported by the rest of the team – Cathy O’Dowd from South Africa and Lhakpa Nuru, Lhakpa Rangduk and Lhakpa Zarok from Nepal. All are highly accomplished Himalayan climbers in their own right (Cathy for example, was the first woman to climb Everest from both the north and south sides), and all six traversed the Mazeno Ridge to the Mazeno Col – an outstanding achievement in its own right. This entry was posted in Commentary and tagged Nanga Parbat, Rick Allen, Sandy Allan. Bookmark the permalink.